2019 Water Circulator Pricing and Install Dates. Info at Weed Treatment tab. 2019 Fireworks: Saturday, July 6. Rain date: Sunday, July 7. Info at Events tab. Annual WLCA Dixie Brunch: Saturday, June 15 at 9:30am. Info at Events tab. Online payment of dues and contributions to Weed & Fireworks Funds now available through PayPal. Info at Pay Dues tab. Webster Lake Conservation Association (WLCA), founded in 1950, is a non-profit organization serving residents of Webster Lake. Our Board of Directors and Committees work closely with the Indiana Department of Natural Resources (IDNR), The Watershed Foundation, and independent vendors to monitor water quality and aquatic plant life and to address elements in our watershed that could endanger the quality of our lake. In addition, WLCA sponsors social, recreational, and educational activities for all lake residents. WLCA's mission is to represent and cultivate the best interests of its membership and property owners by assisting in controlling the inlet and outlet of Webster Lake; endeavoring to keep the lake clean and safe for fishing, swimming, and boating; and encouraging the property owners and members to work together for the improvement of the lake. WLCA's purpose is to make the region healthful, restful, and attractive in the belief that doing so will help to enhance enjoyment of the lake and maintain and/or increase lake property values as well as benefit local businesses and the community as a whole. WLCA communicates to its membership and interested persons with this website and by publishing and distributing Newsletters. Click on the Newsletters tab to read past Newsletters. 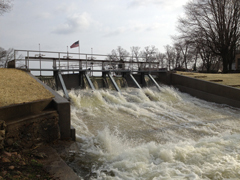 The WLCA maintains the dam to control the lake's water level according to DNR regulations. Our volunteers maintain a database documenting the water level at the dam. WLCA performs multiple water quality tests and secci dip clarity tests each year. These tests monitor oxygen, dissolved oxygen, phosphorous, nitrogen, pH, E. coli, and temperature. These efforts have been vital in decisions made by the DNR relating to our lakes. WLCA also employs an independent contractor to provide aquatic plant studies to meet DNR requirements for weed treatment permits and to participate with the WLCA in discussing and advocating these matters with the DNR. WLCA has taken aggressive action to eradicate the notorious exotic Eurasian milfoil vegetation that has created havoc in many Indiana lakes. Click on the Weed Treatment tab for current weed treatment information and history. Information relating to weed treatment and water circulators may be found by clicking on the Weed Treatment tab. The Safety Committee places buoys to mark idle zones and potentially hazardous areas around the lake according to DNR regulations and directives. They also work with the fireworks vendor to ensure safety at the annual Fourth of July Fireworks display. Click on the Information Links tab for additional safety and regulatory information. © WLCA. Last updated March 23, 2019.